In a medium saucepan heat 2 ⅔ cups milk and chocolate at medium temperature. Stir until chocolate is melted and mixture bubbles on sides. Stir constantly. In a bowl, whisk sugar and salt and your choice of thickener depending on which result you liked most: cornstarch, flour, tapioca, or gelatin. Add the remaining ⅓ cup of milk to the mixture and stir into milk mixture at low temperature until it becomes thick (about 5 minutes). Cool slightly, stir in vanilla and eat! For my experiment I will be changing the thickening agent in my pudding and seeing how it affects the texture and deliciousness of the pudding. I will be using cornstarch as given in the original recipe as well as the same weight of tapioca, wheat flour, and gelatin. Different thickening agents react differently to moisture and heat so my goal is to create puddings with four different viscosities. The first three thickeners I am using are starches (wheat flour, corn starch & tapioca). A starch is the part of a plant used to store energy. It is a complex carbohydrate that can be broken down into glucose to be used as energy by the plant. When using a starch as a thickening agent what makes it thicker is the hydrocolloids. These are made up of polysaccharides and proteins and are in the form of a polymer chain. A polymer chain is a chain of molecules that have a linear and branched network. These are broken apart when heated and create a very viscous substance with a process called starch gelatinization. The first chemical reaction occurs when it is heated up and the water is absorbed into the amorphous space of the starch. This causes swelling in the starch molecules and begins to thicken the pudding. Molecules of starch are radially oriented in a starch granule. As the granules size increases so does the number of branches in the molecule; this results in a crystalline formation of a starch granule. At room temperature the crystalline regions of the starch don’t allow for the water to enter, but when it reaches a higher temperature the amylose chains begin to dissolve. Amylose chains are made up of a 1-4 bound glucose molecules. The carbon atoms in glucose are numbered starting at the aldehyde carbon therefore in amylose the 1 carbon on one atom is connected to the 4 carbon on the next glucose molecule creating a chain. This is a process where the intermolecular bonds of starch break down from the heat and water and the hydroxyl hydrogen and oxygen are exposed and able to engage with more water. During this process the structure and placement of the starch granules become more random and absorb more water making the pudding even thicker. After this the granular structure of starch begins to disintegrate and you are left with a smooth pudding. Different starches require different temperatures and times to gelatinize but to not skew my results I cooked them all at the same heat until they began to thicken then for 5 minutes longer. The gelatin has a different interaction with the other ingredients to thicken it. Gelatin is made from long chains of amino acids, the building blocks of protein, with hydrogen attached. At room temperature these bonds are formed into a triple matrix where multiple chains bond together and form a 3D matrix, somewhat of a ball of amino chains. When heated up these bonds break apart and the gelatin turns to liquid. As the liquid is cooled the chains begin to attach again turning solid again. The oxygen molecules attached to the outside of the amino acid chains bonds with the liquid forming a very weak bond. The reason the bond is so weak is that a chemical reaction does not really take place. The oxygen molecules are attracted to and attach to the water but the water stays as H20 when bonded. The gelatin attaches the water to itself very weakly and creates a gelatinous form which we call jello. Jello is a brand name but it is what most people commonly refer to as any dessert with a gelatinous texture. The reason I decided to do this experiment is because I think chocolate pudding is delicious. I wanted to do a dessert and my mom recommended pudding because it can be made with a large variety of thickeners. Pudding has not been something I eat often in my life so I liked the idea of making it. It was good to switch the thickeners in the pudding because it was an experiment that gave me very visible and varying results. There are many things that make cooking and doing science similar. The first thing is that when you are cooking you are experimenting with heat and ingredients. A chef is basically a scientist who has created recipes that cause chemical reactions and produce something delicious. Every recipe made is a scientific paper because when mixing and heating or cooling your ingredients you are causing chemical reactions that make the ingredients change in different ways such as rising, thickening, melting and more. There are a lot of ways a chemical reaction could affect your food. If you are baking something like muffins then the heat causes your batter to rise and thicken into bread using the flour, baking soda, water, and heat to do so. Most chefs do not science with their food with the goal of achieving a delicious results while food scientists may be experimenting with other results related to food to learn new reactions or results of mixing ingredients to then be used to make good food. A food scientist is a little different because they have a broader range of research. In general a chef will be cooking to try to make something delicious while a food scientist could be mixing ingredients for a large variety of reasons. They could be creating good food or they could be creating poison or not very tasty food by combining two foods. Their goal is to better understand reactions between ingredients and learn why these things happen. The chefs then take this information and create food based of pre determined chemical reactions between ingredients. I think that chefs and food scientists share similarities and differences. They both work with food and use science to create food but I think chefs experimentation is for the flavor of the food while food scientists experimentation is for the reaction in the ingredients. To design an experiment with food to achieve comparable results there are two main things you must do. First of all, whatever ingredient you are trying to replace in the recipe must be a similar reactant and of the right ration to what is used in the original recipe. For example in my pudding project I used corn starch, flour, and tapioca, all starches. This means that although the thickener varies, all starches will have a similar effect on the recipe. If I tried to make pudding and replaced my thickener with an ingredient that does not thicken like water, the pudding would stay liquid because it would not react with the other given ingredients. The second thing you need to be sure of to have an accurate experiment is that all other ingredients do not vary. In a recipe you must only change a single variable per batch so as not to skew your results. If you change both the thickener and the sugar in two different batches you would not be able to tell what caused the difference in the finished recipe. There are two ways to measure if you have created your desired recipe or not, quantitatively and qualitatively. The first thing you can measure in your results is the qualitative, this is the quality of the food for example how it looks and tastes. If the food does not look very good it will have less appeal even if it tastes delicious. I ran into this problem during my experiment because my pudding was delicious but it did not look very appetizing, therefor I had less people try my experiment than I would have liked. It can be hard to measure a recipe qualitatively because something may look and taste delicious to you but not so good to other people. When doing an experiment there are many ways to change your qualitative data such as changing cook time so it looks different, or changing and ingredient to create a slightly different taste. Quantitatively measuring results can be much easier. This is because quantitative data is based completely off of quantity and numbers. If you create an experiment and change the amount of one ingredient then your quantitative results will similarly be a change in mass of the final product. Quantitative data can also help you when changing recipes. For example if I made my pudding and add double the thickener I could theorize that the pudding would turn out twice as thick. But using quantitative data you would realize that there is not enough water in the recipe to double the thickener and the resulting pudding would be thick and lumpy due to unreacted thickener. One very interesting thing I learned in this project was the amount of metals and minerals in the river at some points. Our project talked about how during the Gold King Mine spill there were thousands even hundreds of thousands of pounds of metals in our river. Another thing I learned about was how this effects our fish habitat. I love fishing and fish so this was the most interesting part to me. A few people came in and spoke to us about trout and I learned how in the past the brook trout were forced downstream by high acidity in the water in the upper animas. After years of work on filtration systems and water treatment plants the trout upstream of Durango have greatly increased. During the exhibition I learned from Jim White, a man who works for Colorado Parks and Wildlife that dilution of the metal full river does not reduce the toxicity as much as pH does which was very interesting. 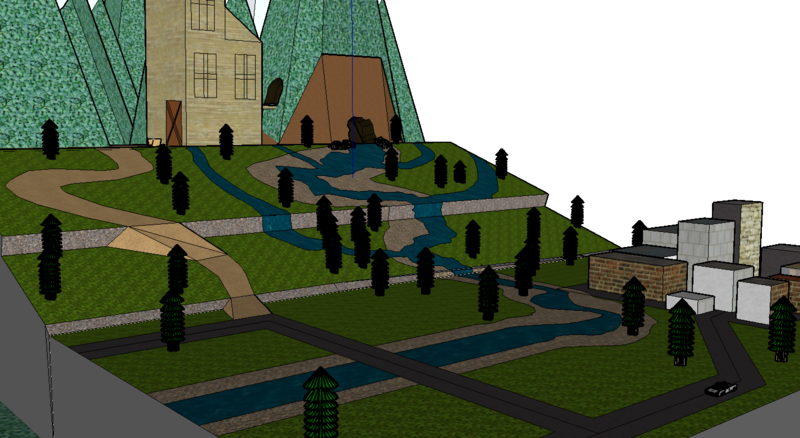 The most important skill I learned during this project was google Sketchup. I have used this program i the past both for school and entertainment but I have never built something this complex. I started by making my base and building the town but as soon as I got to the hill I realized I barely even knew how to tilt a flat surface. I spent lots of time in and outside of class working on this and eventually made a product that I was proud of. I also practiced my skill of patience because three days before the exhibition my computer crashed and deleted my whole design. I knew that getting mad about it would not help anyone so I just focused, was patient and finished the second version in time for exhibition. The second round did not take quite as long because I had a general idea of what it looked like and I think came out cleaner. I think that learning about water quality is important to do in chemistry and definitely something that will help in the future. As we get older we will be able to vote for different laws regarding many things that could effect our water and now we know what it actually means. I know theres plenty of adults who vote for laws like these having no idea what it actually does to the water or how it will effect us or our ecosystem. After learning about this stuff in chemistry this year I think I will remember a lot about it especially relating to the effect on animals because that is what impacts and matters to me the most. Our exhibit is based off of the effects that come from acid mine drainage into mountain rivers. Our interactive exhibit will be displayed through a large scale diorama which can be used to show the effects of an acid mine spill through discoloration of water. Acid mine drainage can be harmful to aquatic and environmental life. Our goal is to inform our audience of the dangers of acid mine drainage and how the issue is solved through the water treatment process. We would like our audience to learn about what acid mine drainage is, the amount of metals that are in the water, and how the drainage affects the ecosystem and aquatic life. We would like for them to walk away with knowledge on the pros of dilution and filtration as well as the affects the metals have on humans. Our audience will be engaged and having fun. We want them to feel involved in the interactive experience as well as use creative thinking to determine the outcomes from the spill based on our prototype.They will be curious about the treatment process, the amount of effort put into it and how they could have done more. They may be curious about what metals are in their drinking water and the way the water treatment plant is filtering these toxins. They may also want to know how the acids affect human well being. The issues and challenges explored throughout our exhibit communicate how an acid mine spill effects the river quality, people, ecosystems, and aquatic life. Our exhibit shows the process of an acid mine spill in a river, flowing into Durango. It proves the river filters and dilutes the metals to an extent but it also shows the way the spill stays in the ecosystem. The scientific concepts that we are teaching include pH of the river before and after, dilution, filtration, and the amount and effects of the toxicity from the spill. The audience (if your a community member) will be able to remember the mine spill and effects it had on the community. When they can view a prototype of the same scenario on a smaller grid allows them to understand the process of the spill. They will have the ability to see where the metals and other toxins collect. A view of each stream will help create a dilution visual. At the end of the river there is a pool showing the amount of toxins that end up being filtered out at the Water Treatment Plant. To develop our design we used a lot of statistics from the original spill. We had to incorporate the same amount of water and particles released at the time and bring it down to a smaller scale. We decided on this topic because it was a major issue for the community when it happened and many people don’t understand the severity of it. We used SketchUp to create a model of our prototype. 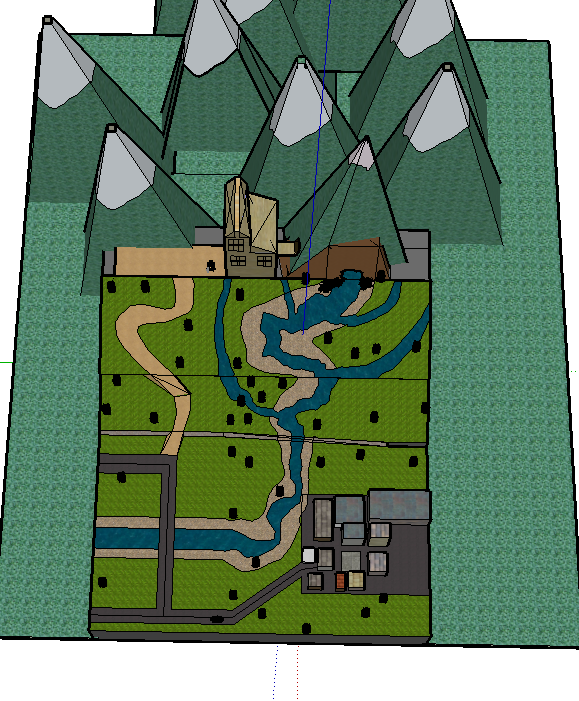 It includes a visual of durango with the river leading to a mine on the mountain. There are other streams feeding into the river to portray how it dilutes the river. Our work as well as our classmates work come together to form a broader picture of the river in our community. Our project targets all ages. We have designed a process that engages the audience with content as well as an interactive model. All levels of education are invited to participate and it includes different aspects for all types of thinkers. We want our audience to interact with the design throughout the whole cycle. What we mean by that is when the mine spill flows throughout the river and gets to the end allowing the viewer to see the dilution, filtration, and the large amount of chemicals left in the river. Our exhibit has multiple engaging aspects such as running water, sparkles for the chemicals and a prototype that displays Durango. They will also be extremely engaged because it has been an issue in the past for our community with Silverton being a main contributor to mining around the Animas river. Our exhibit allows a lot of hands on activity. You will be able to work with glitter, water, pebbles and many other substances representing the chemicals in a mine spill. The role you will be playing is that of a passerby. You will learn how the process works and the causes and effects. You will be able to view our model as a citizen of Durango. Our exhibit should be included in the City of Durango’s final plans for the remodeled Santa Rita Wastewater Reclamation Facility because it would be a great educational addition to the facility where people of all ages could learn about acid mine drainage. Our interactive model can teach a wide variety of community members and be used to teach them about the treatment process of acid mine drainage.